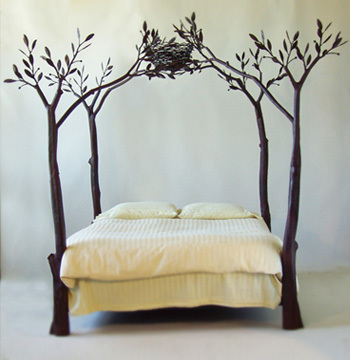 I am in love with this bed by Shawn Lovell, who just won a 2008 Niche award. How could you fail to sleep well? 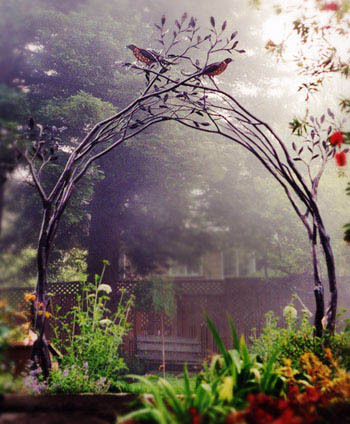 I also covet her gorgeous trellis. Of course the whole established perennial garden is part of the dream too. Better find me a plot and get digging. This entry was posted on Wednesday, May 21st, 2008 at 10:06 am	and is filed under sculpture, web. You can follow any responses to this entry through the RSS 2.0 feed. You can leave a response, or trackback from your own site. Love that bed so much! I’m picturing it with astroturf floor and sky blue walls…maybe too much?!! I can pass on the bed and trellis, but an established perennial garden??? Now that would be wonderful. I love that bed, too! Maybe it will fit in my new house (hint, hint). That bed is amazing! She’s such a gifted artist. Gorgeous bed, indeed. Fairytale-esque, for little girls AND big girls. How’s the house hunting coming along? The house hunt is at the “are we there yet? !”, finger-crossing stage. it’s a lovely bed, but i know i’d be freaked trying to fall asleep. i’d be tossing and turning thinking that imaginary eggs would fall on me. That bed is truly beautiful!